The circus has left town again. Obama, Hu, Lula and Sarkozy are moving on to their next diary dates, as are the black-clad Guerrigilieri Anomali. So what to make of the G20? — we’ve been teaming up with the unions and NGOs and bombarding officials and leaders with campaigns for weeks, we delivered our G20 campaigns in person to Number 10 and to Dominique Strauss-Kahn (“DSK”, who heads up the now-supersized IMF)… and I still wasn’t sure how much we were getting through the noise. But when I look at the big picture, you know what? Beyond the hoopla, the sequins and the brief flurry of street violence and flawed policing which some have experienced, progressives got a lot of what we wanted this week. We wanted two things last week: some bold initiatives to fight the crisis and start to fix a broken system. But just as importantly, the beginnings of a new shared understanding that we’re not isolated spectators or victims — we sink or swim together in this crisis, and this isn’t just about leaders, but about us — because without us the politicians alone will inevitably fail to rise to this great challenge. So how did we all do? The dust is still settling, but here’s a quick overview. 1. There is serious money for the “global rescue package” for developing and emerging economies we were calling for, and this will make a real difference for the poor and vulnerable. Most critical here is the agreement on $250 billion in Special Drawing Rights (big new international reserve funds available to everyone, especially poorer countries, without onerous conditions). Avaaz made a last-minute push for the SDRs and we consider this an important victory. The rescue package overall has put global solidarity and supporting the weakest at the heart of the response to the crisis, and it also starts to point the way toward correcting some imbalances and root causes. (The influential financial groupblog FT Alphaville namechecked our role here, and that’s a good place to start understanding the strange importance of SDRs; also see Oxfam’s response on the wider social justice issues). 3. The third success of this London summit is that these advances happened substantially as a result of growing public pressure around the world. At the Washington G20 meeting last year, citizens seemed like helpless spectators. That has now changed. That extraordinary peaceful march of tens of thousands of citizens, unions and NGOs through London on the weekend before the summit was supported by hundreds of thousands around the world, and it had a serious and positive agenda (symbolised for the Avaaz contingent by the green hard hats). And we know from those who were inside the summit that advocacy by ourselves and allies, notably the unions and anti-poverty groups, made a real difference in the final outcome. Citizens and civic groups everywhere need to build on this success during the vital coming year, pressing leaders to go far beyond their comfort zone and to tackle the fundamental problems which birthed this crisis. It’s down to us — with powerful vested interests still holding sway, our leaders won’t do what’s needed unless the countervailing public pressure is clear, positive and overwhelming. (Thanks to Sunder Katwala for posting something I said on this while still caught up in the whirlwind). While it is good that the summit declaration talked about a sustainable green recovery and a climate deal at Copenhagen, it was for the most part only talk. This was perhaps the biggest failing of the summit. 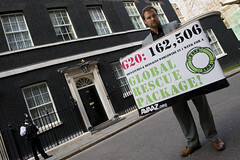 Avaaz members had been calling for big investment in green recovery, and for at least 1% of GDP to be invested in everything from home insulation to renewable energies, public transport and smart grids (based on research and policy from the UN Environment Programme and others). That hasn’t happened yet, though the G20 has set up a group to try and make more practical progress. We can’t let them sweep our future under the carpet of short-term caution. But crucially, the global fiscal stimulus so far has been not invested in a sustainable enough way. Except in a few leading countries like South Korea, investments are locking in more polluting infrastructure. They will leave us vulnerable to a new oil price spike, as well as a deepening climate crisis. So it seems the powers-that-be will need a few more months, a lot more inventive planning and some serious pressure to pull together better, greener stimulus and recovery programmes. Another urgent target is fundamental reform of the IMF, to make sure its huge new resources are used more responsibly, and we’ll be targeting their spring meeting. Watch out DSK. Paul Hilder is campaign director at Avaaz.org, the global web movement with 3.4 million members, and is writing in his personal capacity. * “Not only have we saved the world” — for those who don’t know, Gordon Brown said this by accident a few weeks ago. And yes, we have some way left to go. This article was first posted on Liberal Conspiracy. Thanks for the post. Those green hard hats are an excellent way to animate the argument. I hope those Fabian members and other Next Left readers who are not already part of the Avaaz network will look at getting involved in this campaign and the other initiatives and campaigns: the case for sustained and positive civic pressure over time is massively important in between the big summits which hit the headlines. What has struck me most about Avaaz in its relatively short lifetime is its ability to mobilise imaginative ways to show how positive pressure for change is possible on issues from climate change to the Middle East that are too often prone to debilitating pessimism.